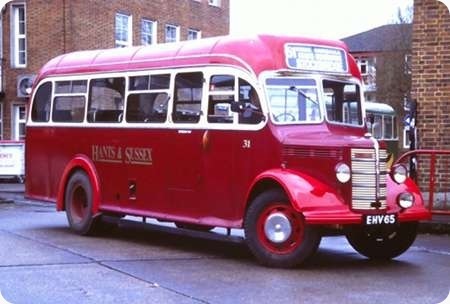 Old Bus Photos » East Ham B. C.
Here is a view of EHV 65. This Bedford OB was new in 1951 to the Education Department of East Ham Borough Council. She has Duple B29F and is seen here in Hants & Sussex livery during the King Alfred Running Day in Winchester on 1 January 1996. So far as I can gather, she was never a PSV and never operated for Hants & Sussex, but others may know something I’m missing! But whatever the history, she looks rather splendid in your photo, Pete. Hants and Sussex in all its many company guises certainly operated a great many 29 seat Duple bodied Bedford OBs, but this was not one of them. As I recall, the front wings and rear mudguards should be maroon to be an accurate representation of the Hants and Sussex livery, unless my high mileage memory is (yet again) playing tricks. EHV 65 was as you say new to East Ham BC, and when bought for preservation by Cliff Burgess and Clive Wilkin the decision was taken to present it as a Hants & Sussex bus as none survived from the original H & S fleet. It is kept at the City of Portsmouth Preserved Transport Depot, either at Portchester or East Meon.